Stamp collecting is not exactly a new trend sweeping through the world; In fact, philately (or the study of stamps), and stamp collecting have been of interest to many enthusiasts for over a century. In fact, the American Philatelic Society (APS), which is the biggest congregation of philatelists and stamp enthusiasts in the world with over 40, 000 members, was established in the year 1886. However, the standards by which the marketability and collectable worth of stamps have more or less remained constant. Stamps, generally, are determined as worthy of being collected on the basis of the quality of the stamp and rarity. Under the qualification of quality is firstly the physical wholeness of the stamp. In effect, it must not be creased, folded, and must still have complete perforated sides. In addition, considerations on its centeredness have the capacity to jack the prices up or drive them down. Centeredness means that the design is placed in equal distances from the perforated edges on all sides. An alternate definition for centeredness is that the perforated area under the design is much larger in measure than the one at the top. Colour also plays a huge factor in the quality of the stamp. Consistent exposure to the sun and wrong storage methods can cause the colour of the design to fade. Moreover, many amateur stamp collectors make the mistake of soaking stamps to remove them from the paper without taking into consideration the ink used to print the stamp and the ink of the cancellation on a used stamp. Many stamps issued before the 1940s were printed using fugitive ink, which runs in water. Other times, a used stamp will have a cancellation that runs on water. Soaking the stamp will cause the cancellation’s ink to run into the design, completely compromising the quality of the stamp. Another important factor to bear in mind is that stamps can often be worth substantially more if left on the envelope or on cover. Aside from that, the condition of the gum or adhesive film at the back of the stamp is also taken into consideration. A stamp with its gum more or less still intact is much better than one that has been severely damaged by licking and sticking often from previous mounting. As for rarity, this is rather obvious. How rare it is would more or less imply the degree of difficulty posed upon a collector to acquire the stamp. A mint or unused stamp has equal chances of being as expensive as a used stamp, and this is best determined by the availability of the stamp. A stamp with lesser propensity of being used on letters would be more expensive if it were acquired as a used stamp; a stamp, on the other hand, that was used in letters in huge volumes would obviously be much more expensive in its mint condition. The exception to this general rule of thumb is stamps that were already acquired at a steep price. These stamps, acquired expensive even when they are used, will likely to have prices hiked if the great demand to acquire it continues to increase. However, there may be great difficulty in trying to assess objectively the possible market value or worth of a stamp. 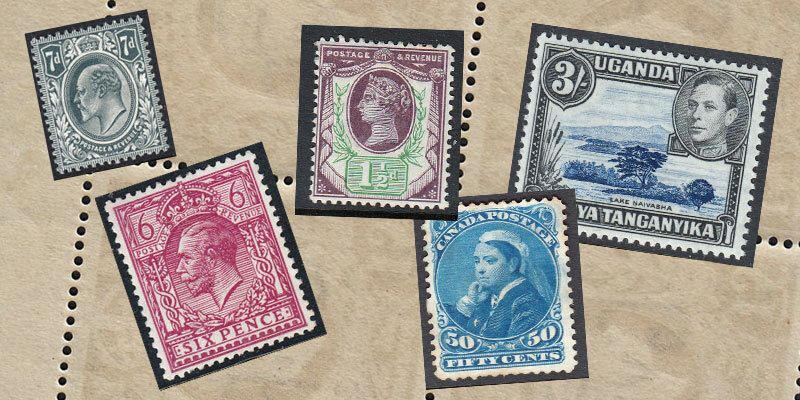 Expert philatelists who are connoisseurs in stamp valuations are most likely able to objectively assess the worth of the stamp. These expert philatelists are not very hard to find. They are usually some of the stamp enthusiasts who’ve had much experience in trading, selling, and collecting stamps. Their services are made most accessible to members of philatelic clubs of which they are part. Some associations that afford their members the services of expert philatelists include the American Philatelic Society (APS), and its member organisations in various states and cities. And in the UK The Philatelic Traders’ Society which was formed in 1929. On the other hand, other options are of greater accessibility especially to amateur stamp collectors. Across the country, most libraries have more or less an extensive collection of stamp catalogues that help guide stamp enthusiasts in finding out the various stamps issued under a particular theme or subject classification. Moreover, stamp catalogues contain a wealth of information as regards a certain price level for which these stamps are sold in the market. The advent of the internet has led to many philately websites and forums, which also offer useful information and help. Usually, stamp prices are higher in catalogues than they would be sold for by individual sellers in places such as fairs and auctions. Nonetheless, these catalogues are useful guides when it comes to at least being aware of what price range the stamp would fall under and to some extent how common or not they are. The most commonplace stamp catalogues available in the libraries include Stanley Gibbons, Michel, and Scott.